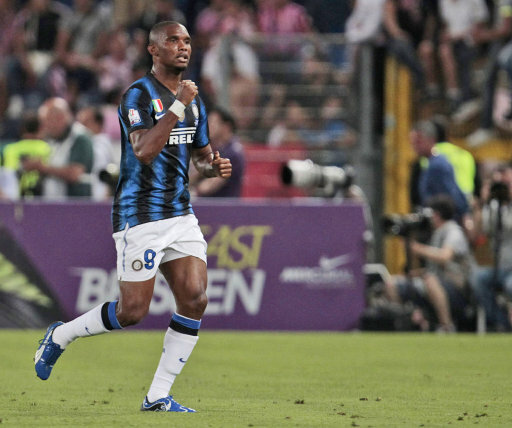 Unsurprisingly, Inter striker Samuel Eto’o’s open admission that, after two years at the Giuseppe Meazza, he now fancies a stab at life in the Premier League has set many-a gossip hound’s tongue a-wagging. “I am currently considering my options. I have one month to decide as to whether I want to stay put or choose to move to the Premier League. “I am now 30 years old and it is very important for me to think about my future before I sign what could be my last contract. Oh it must happen, it simply must – though quite where Eto’o will wash up if he decides to do one this summer is another matter. Surely Arsenal and Spurs must do everything in their power to land him? Though you’d have to assume that Manchester United, Manchester City (especially if Tevez scarpers) and Liverpool, perhaps even Chelsea (just because they could) wouldn’t exactly be willing to sit around and let them go about their business in peace. Be good for arsenal or tottenham. I dont think any of the top 3clubs would want him. I don’t think he’d fit in at Tottenham, but he’d do well at Spurs. his wages would be sky high so I hope Liverpool don’t want him, go for a younger prospect hopefully. Good choice for spurs or the gunners though. @wiggs: What? You’re talking about the same club. Hoping for the gunners to land him, should he be leaving Italy this next window. he probably wouldn’t fit in well at Chelsea, but at Stamford Bridge… oh yeah! One thing’s for sure, he won’t be able to play for both Rushden AND Diamonds. @wiggs, I agree. North London must be a pretty terrible place to live if you’re used to Milan or Barcelona. But somehow I don’t think that’s what you meant. @nikoo I think any club anywhere would want him. I believe he may very well go to Manchester City, given the unlimited funds they’re allowed to play with (and wouldn’t bet against a swap with Tevez).